Show Appreciation to Your Graduates with Stadium Blankets! Stadium blankets are a great way to recognize classmates and teammates at the end of the year while boosting school spirit! 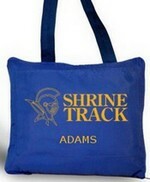 Get them in your school colors, or customize with your school name or logo!